Priyanka Gandhi Vadra's remarks came after the Congress released its 53-page manifesto. 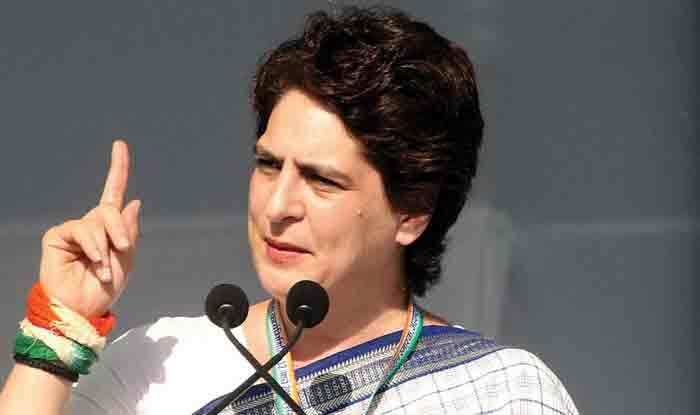 New Delhi: Hours after Congress president Rahul Gandhi released party’s manifesto for Lok Sabha elections 2019, AICC general secretary for UP east Priyanka Gandhi Vadra urged people to make the forthcoming polls about real issues. “I urge everyone, especially young people and 1st time voters- Please read our manifesto. Make this election about real issues,” Vadra tweeted. Earlier in the day, Rahul Gandi and top Congress leaders released party’s manifesto, making a slew of promises, including giving Rs 72,000 each to five crore poor families under the ‘Nyay’ scheme, filling up 22 lakh government vacancies, bringing a separate budget for farmers and fixing a single moderate GST rate. The Bharatiya Janata Party (BJP) strongly criticised the manifesto calling it ‘un-implementable and positively dangerous’. “If you see the 35th page of the manifesto, in point 30, there will be review of rules, regulations. How can sedition not be a crime for Congress? They say sedition would be done away with and treason won’t be a crime anymore. Such party does not deserve a single vote,” Union Minister Arun Jaitley had said.